Its determination to try to make a success of recent developments had seen it persist in pushing down this route, but only when it rolled back on some of its parts did it get confirmation that it still had a quick car underneath it. For Sebastian Vettel, having a competitive car and answers to recent struggles was reason to both celebrate and cry. “It took too long," he said. "You can see it is good news but you can also see it is bad news. "If we have to go back to a car that has been competitive three-four months ago, then surely it cannot be good news if you think about it. Vettel’s remarks about the car going back three or four months in development are slightly unfair though, for some new ideas have worked well. Here we look at the upgrade history to see what has and has not been a success. The current development path can be traced back to Singapore, when against the odds Mercedes which had previously struggled on the street circuit was dominant. Ferrari had worked hard itself to bring upgrades to the race, as F1 moved away from the unique low downforce packages that had been used in Belgium and Italy. 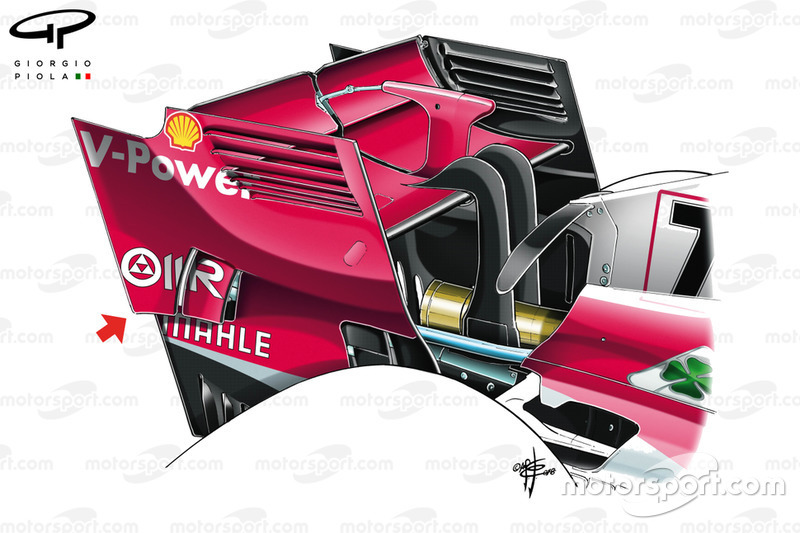 By far the biggest update for Ferrari in Singapore was a new rear wing design, complete with the offset strake design that McLaren, Renault and Mercedes already utilise to try to increase downforce. 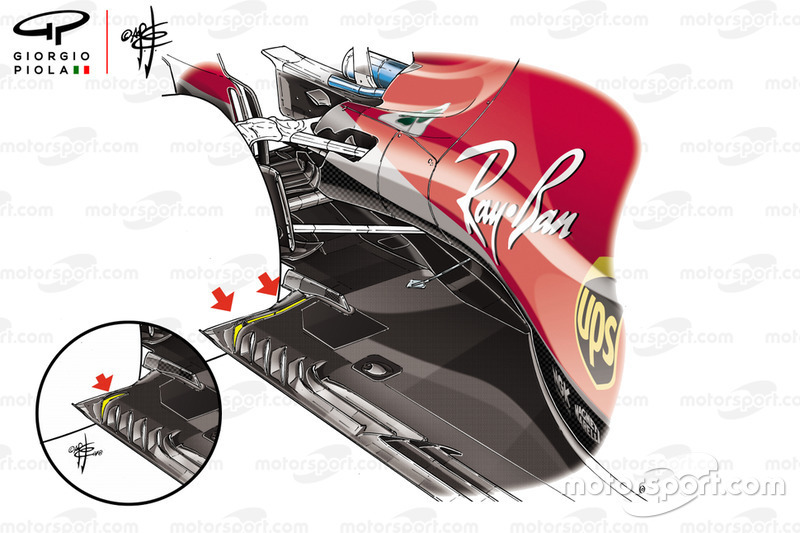 The other area that was given attention was the bargeboards and floor, with the shape and orientation of many of the elements on the bargeboards revised, in order to alter the velocity of the flow around that area for the slow speed street circuit. 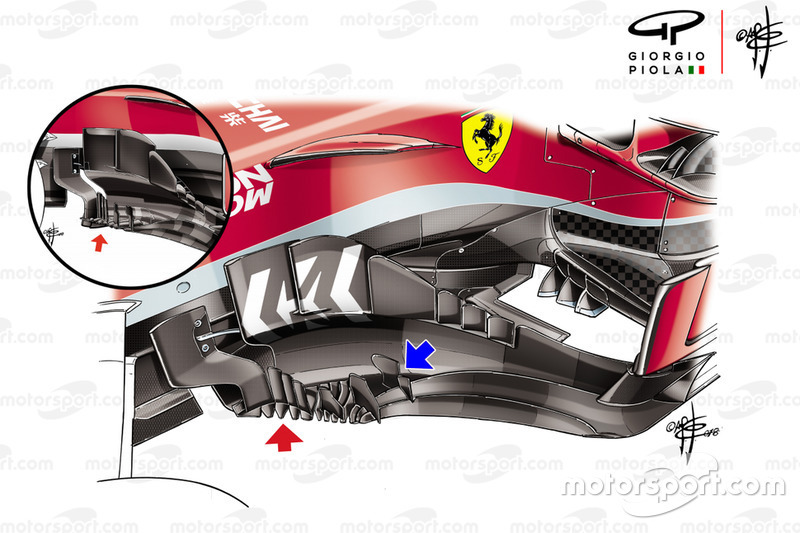 Ferrari hit it hard in Russia, introducing an all-new concept of parts for the front end of the car that was aimed at transforming its potential. This has worked as the team has stuck with it since. 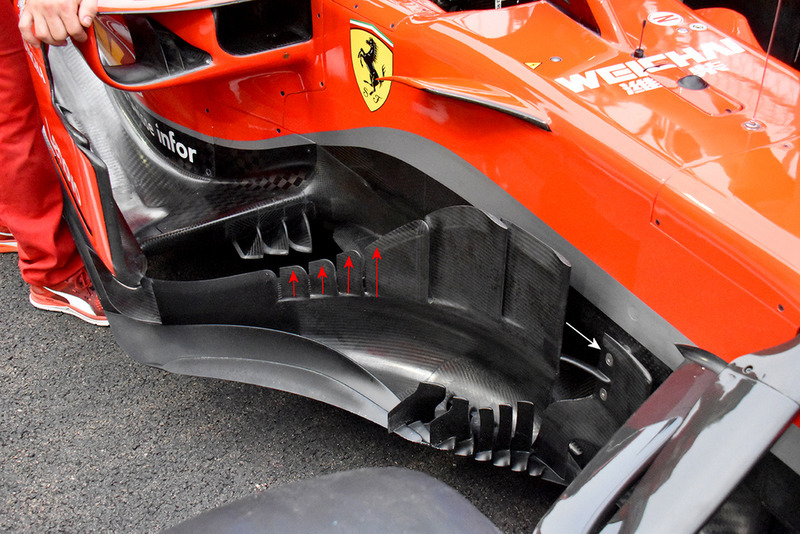 The design team incorporated the novel footplate solution pioneered by Red Bull in 2017 and tested by Ferrari in Hungary, featuring a raised and inclined footplate that’s also pushed back from the wing’s leading edge . Making such bold changes to the outer part of the wing resulted in the design team having to make adjustments elsewhere too. The upturned profile on the leading edge of the mainplane  is a little more pronounced, altering how the airflow behaves, while the furniture  on the inside of the endplate designed to control outwash has also been revised. Coupled to the change in the mainplane’s geometry and the resultant effect the other changes have had on the wing's ability to create outwash the flap geometry has also been amended, with an additional slot made in the outboard section . Perhaps more importantly the team toned down the aggressive transition between the tunnelled outboard section of the wing and the flapped region . The team have also focused a considerable amount of attention to an area of the car that had thus far been relatively untouched throughout 2018 - its turning vanes . The relatively simple design used so far this season was cast aside in favour of a much more complex set of separate forward reaching elements. One experiment that did not work here was a new rear suspension that Kimi Raikkonen tried out and did not deliver the step forward hoped for. 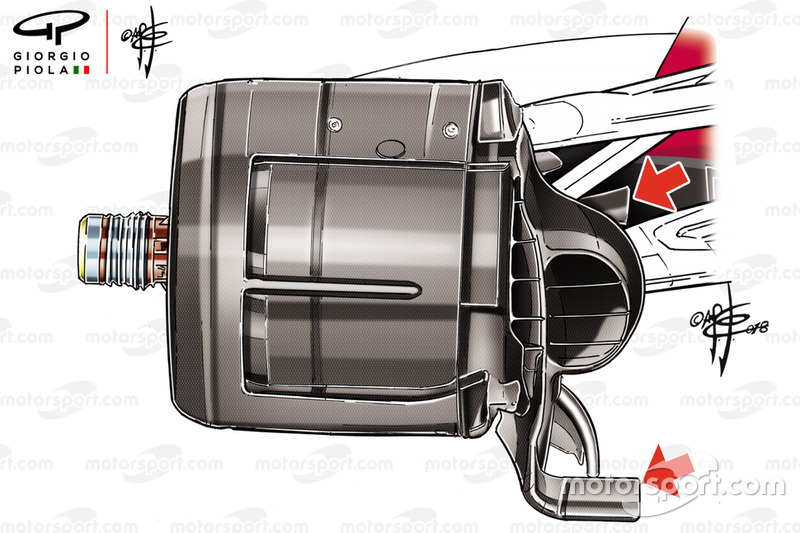 Following up on their impressive front-end update in Russia, the team arrived in Japan with a new front brake duct design, featuring a couple of new winglets, the most prominent of which juts out from the bottom corner of the end fence and helps to guide the airflow spilt from the front wing. This element too has worked and has stayed. The team tried a new floor, widening the rearmost slot all the way across to the vertical strake. It didn’t race the design in Japan, having noticed a tendency for the enlarged slot to gather tyre debris, instead waiting for a more mature version to arrive for the US GP. The team also rolled back on the offset rear wing idea it had used in Singapore and Russia – suspecting that its design had hurt its overall performance on the straights. Raikkonen also tried the rear suspension that had not worked in Russia, and again this was ditched. Ferrari introduced a number of tweaks to its Japan update to try to make it work better. The first of these was the addition of an extra front-wing canard (arrowed) in the row already situated on the inside of the endplate, improving the shape and direction of the outwash the team are looking to generate. This, however, wasn’t used after Friday because of the wet conditions. 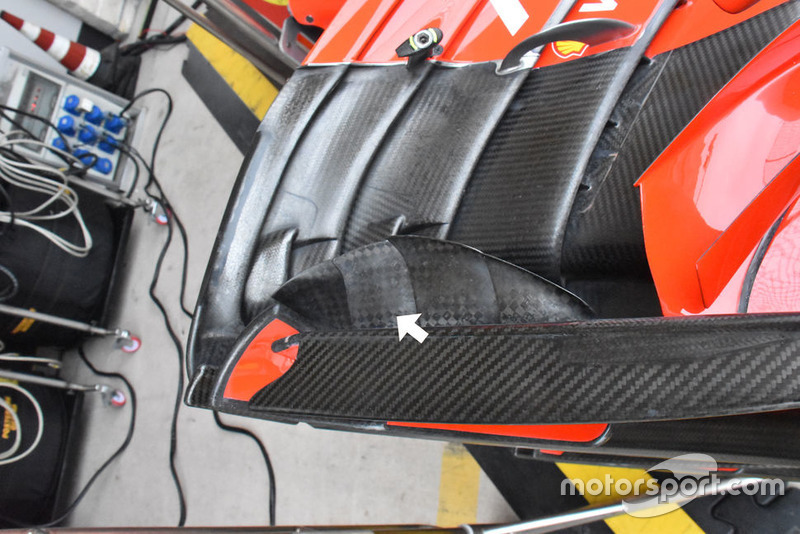 The serrated extensions on the leading edge of the bargeboards footplate were also amended (red arrow below), as the new specification featured nine individual surfaces, rather than six, altering the shape and velocity of the vortices that are likely formed here. Meanwhile, a pair of vertical vanes were also stacked atop the footplate further downstream (blue arrow) helping in the navigation of the localised flow stream. Some of these changes proved successful. But perhaps of most significant was that a modified version of the Japan floor, with a unique array of vertical fins on the outer edge to help cure the debris problem encountered in Japan, was abandoned after practice. This was not necessarily because it did not work but because the team could not be sure of its potential with the wet Friday. But the team’s competitiveness with its old well-known package that had raced in Japan hinted that new parts had not automatically brought something much better. 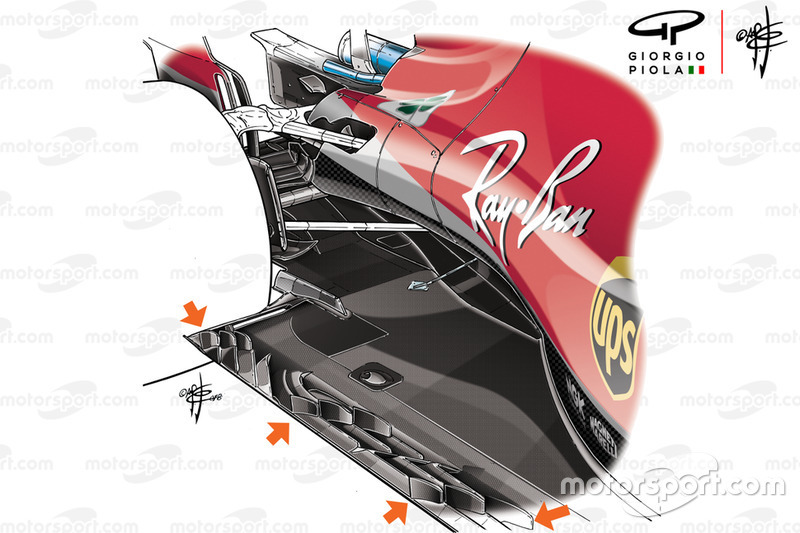 So while some elements of Ferrari’s designs have been successfully modified, it is clear that major ideas – like the Singapore wing and the floor first trialled in Japan – did not add to performance and the team lost many races finally understanding that. 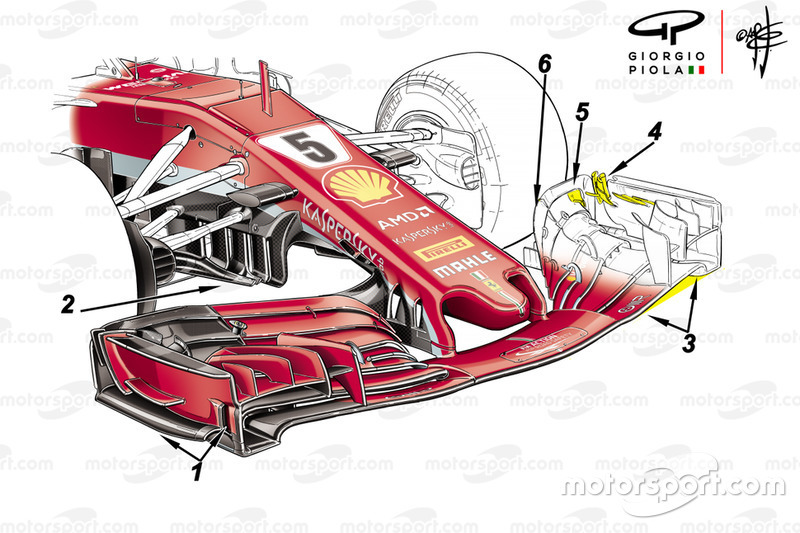 Now Ferrari needs to find answers as to why its development path did not go perfectly to plan.